On Monday I was missing a ligament in my knee, but depending who you ask, it is there today. Friday afternoon, just hours after my MRI, I felt something tear in my knee. It was so weird, like being flicked against the inside of your skin instead of the outside. Complete with a snap, crackle, and pop. So on Monday the doctor told me that I dislocated my kneecap and tore the ligament that primarily stabilizes the kneecap in its tracking. The solution could be rehab or surgery and that was to be determined after seeing the MRI. I thought the imaging would have been deemed useless since the tear conveniently occurred after it, however I was assured it was still relevant. So I figured they would see a ligament on the verge of tearing. So I get the phone call that the ligament in question is indeed attached. So naturally I was confused how it reattached itself in a few short days. I am always impressed with the human body but this would be a whole new level of science. When the doctor was holding my knee in his hands and testing it, he said there was no ligament so I took this opportunity to casually remind the doctor that the popping happened after the MRI. In return, I was told “I highly doubt it was torn”. Later that afternoon at work, someone who treated me many times after the car accident was in the gym working out. 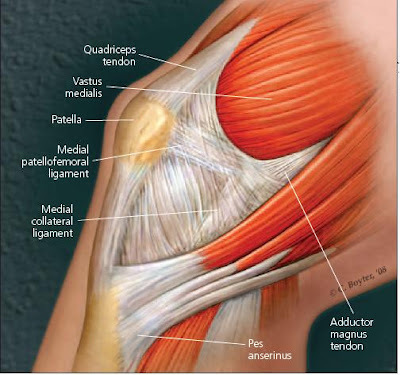 He kindly let me interrupt his workout to casually ask him if he could find my medial patellofemoral ligament. He concluded the left knee didn’t have one. I slunk back to the first doctor to request another MRI. He doesn’t even seem phased when he sees me in his waiting room anymore. I have to have set a new record for MRI requests in a ten day span. Part of me hopes that it is torn so that I can save myself the embarrassment of getting a second MRI for no reason. But at the same time, I realise how ridiculous that is. What is one more blow to my ego, anyways. I do know something is wrong, but that is all I know.